Oh my goodness! You guys have come through for us yet again – the tax return covers are wonderfully perfect! Thank you again for your attention to detail, and to expediting our order to meet our immediate need. I really appreciate the way you handled our print job. I’ve heard from my partner that it looks amazing. You were so fast turning this job around and a pleasure to work with. Thanks for delivering to the hotel... Incredible service! Thanks for the excellent service. Love the Business Cards for What's Happening Performance! First, congrats on the move! Just got your newsletter in the mail and read that you will be changing locations. There is something very grassroots about your current location that I just love, but it sounds like you need the space to grow. It is a big changes, so I hope it all runs smoothly. Secondly, I wanted to send kudos to you on the newsletter. As you can imagine, I get a ton of printed outreach in the mail that I often don't have time to pay attention to, but something about your newsletter always makes me stop and give it a look. Well done. Thank you for your Herculean efforts to get us our menu inserts in such a timely manner last Friday. You made me look like a hero, but it was really you who did all of the hard work! ...Thanks for your great customer service. "They look GREAT!!!!! Your people did an amazing job!!!! I am very happy!!!
" I just wanted to thank you for the brochures. We just got them and they look amazing! (Cami) Thank you for your expertise. The responses we are ALREADY getting is A+++. You are very talented and I am just so happy with the result. I know I wasn't easy to work with, so it makes the end result all the more appreciated." Maisha Hollis, Editorial Assistant. National Student Nurses' Association Inc.
On behalf or the National Student Nurses' Association, I wanted to express our thanks for your superb service and customer support during our Convention in Salt Lake City, UT, the week of April 6-10. Your Prompt pick-ups and deliveries made an inherently hectic week a much easier process for the press staff. Additionally, your flexibility, positive demeanor, and excellent customer service were all much appreciated. Equally, the quality of print of the Convention News was exactly what we needed. Thank you again. I hope that when we find Ourselves in Salt Lake City in the future, we can have the pleasure of working with you again. Our farm-ranch-land real estate brokerage firm has been doing business with Presto Print for 36 years and could not be more pleased with the quality of their work and the promptness of their service. We publish very detailed and attractive offering brochures on 15 to 20 large properties every year and receive many compliments on each piece. It has been our pleasure to enthusiastically refer many people - including other real estate brokers and clients - to Presto Print. We consider Presto Print as an important partner in the ongoing success of our business. I have worked with Presto Print for all of my printing needs for nearly 15 years. Over that time period I have changed employment with 3 separate companies where in each case, was utilizing the printing services of competitors, even once was an out-of-state venture. 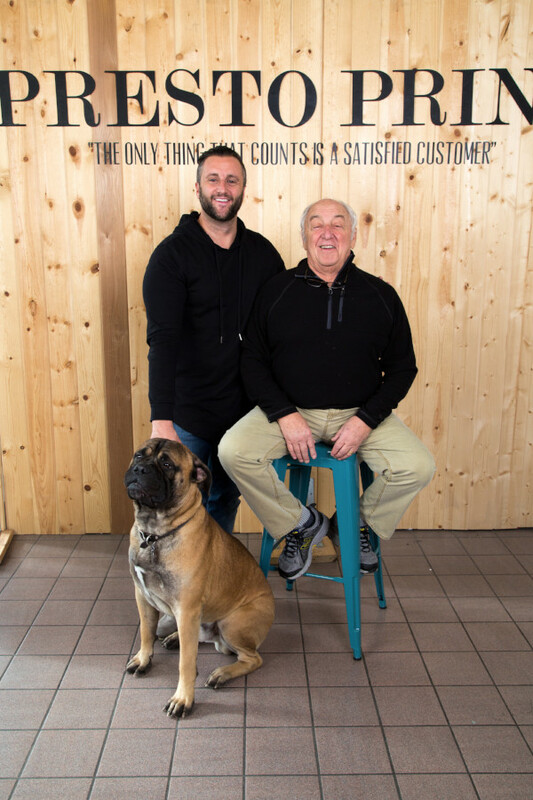 Given my history with Presto Print and the friendly, professional and excellent service I have always received, I insisted that we utilize Matt and his team! Presto Print remains constant and consistent in service, price and always a timely delivery! As such, I shall forever remain a loyal customer. Thanks Presto Print!! I have relied on Presto Print to do four color offset and digital printing of all our collateral materials for years. I have grown to trust their quality, dependability and timely delivery of every project. Keep up the great work! Presto Print is always my first call when I need a print job done. 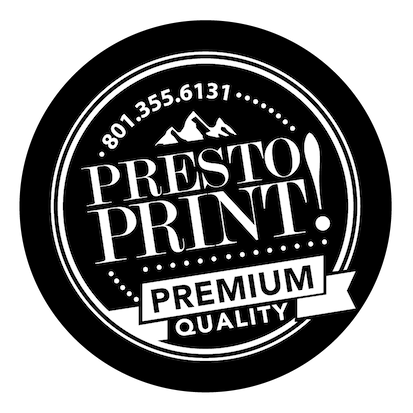 In all my years of doing print advertising, the guys at Presto stand apart as not only the most friendly people to work with, but they’re always accommodating – I can always count on them to get a last-minute job out on time. Not only that, but their print quality stands above the crowd, and their pricing is the best you’ll find anywhere else. There is simply no better printing shop in Utah. After working with Presto for so many years, I consider them all to be friends. Presto Print has offered our non-profit association exceptional pricing and quality service for over 5 years. We have never been disappointed by their willingness to assist us so zealously and promptly. Other printing services haven’t come close to comparing to their expertise. I couldn’t do my job without Presto Print. Whether it be a well planned project or something I need on the fly, they consistently deliver a solid product – and always ahead of time. I continue to recommend them to any individual or company that values good print work. Presto Print has the best customer service you could ask for. We all have the last minute print jobs that need to be done immediately and if you call Presto Print they’ll make it happen with no exceptions. I forgot to email you at the time but I just wanted to Thank You for the quick turn around on the stickers we ordered! I was so impressed they were here within hours of ordering! This is why I continue to bring our business to Presto Print, because every time you guys wow me even more! Great Job! Just another huge thanks for helping us out with the Lawn Signs. They look beautiful, and are honestly a lot better than your competitions. Plus you made them in a phenomenally short amount of time. We appreciate your business tremendously!" Presto Print would love to put your testimonial here. Send us an email describing your experiences with Presto Print.